Trekking along the Markha River through "Little Tibet," one of the world's highest inhabited plateaus, you take in spectacular views of the Great Himalayan, Ladakh & Zanskar ranges. You will cross two high passes at elevations up to 17,400'. Trails wind past willow groves, alongside patches of wild roses & through pastel canyons festooned with multi-hued prayer flags undulating in the breeze. The opportunity to meet nomadic families as they herd their yaks & a visit to a small monastery where butter lamps are lit morning & evening by an elderly nun leave indelible impressions of our journey through this gloriously illuminated landscape. 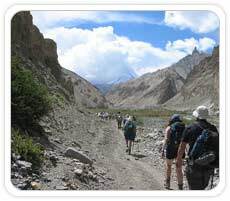 After the initial period of acclimatization to high altitude in Leh you will set out to explore the heartland of the central Ladakh Valley. It involves crossing of the three passes - Stok La- 4848m, Kagmaru La- 5274m, Gandla- 4878m & walking on the banks of the Markha River. 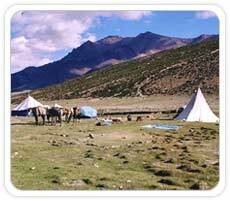 The highlight of the trip is the camping at the base of the Kang-Yutze peak on the plains of Nimaling. Early morning transfer to the Domestic Airport to board the flight for Leh. Upon arrival at Leh Airport our representative would assist you at the Airport & transfer to the Hotel for check-in. Rest of the day at leisure & acclimatization. Later in the afternoon a walk around Leh town (3521 m) & visit Leh Market, Leh Palace ruins, Leh Gompa & Shanti Stupa. This walk shall help in getting acclimatized at this height. Today we drive 16 km from Leh & visit Shey, the ancient capital of Ladakh. The monastery here has a huge gold-gilded statue of Buddha Shakyamuniwith a large silver lamp burning in front of the statue. After that we drive few kilometres & cross the bridge over the mighty River Indus to reach Stok. We visit Stok Palace,the Royal residence of the King of Stok & the Museumthat has a rich collection of ancient Ladakhi artefacts including old Thangkas, precious stones, arms & armoury, the Queen’s necklace & the crown of the King of Ladakh among others. After early lunch at Stok we start trekking towards theBase of Stok La.It is a gradual walk with a few kilometres of ascending path, which will be covered in about 4 hr. Today we trek to Rumbak over Stok La (4800 m). The 3 km trek upto Stok La is steep ascent & then it is a steep descent upto Rumbak. The total distance of 12 kms will be covered in about 6 hr. Rumbak is a small shepherd village with few houses. Today is a long day & after early breakfast we trek towards Skiu over Gand La (4930 m). It is a climb upto Gand La top & then a descending path upto Shingo & from there we reach Skiu (3380 m). A distance of 18 km will be covered in about 8 hr. Today we trek to Markha via Hermoger & Sase. An easy walk of about 15 km will be covered in about 6 hr. Markha (4500 m) is the main village at the height of about 4500 m & it also has a school. Today we trek upto Hankar via Omlung. A distance of about 12 km of gradual walk will be covered in about 6 hr. Today we trek to Nyimaling, a gradual walk of about 12 km will be covered in about 6 hr. Today the day is free to explore the surroundings. One can trek upto the glacier of Kangyatse peak (6030 m), one needs permit from (Indian Mountaineering Foundation, IMF) to climb this peak. Today we start our steep ascent of 4 to 5 km to Kongmor La (5200 m). On reaching the top one forgets the tiredness of the steep climb after viewing the beautiful range of Mountain peaks & feels refreshed. From the Pass we descend all the way to Chugdo. Today we trek down to Hemis via Oza & Sumdo. A gradual walk of about 13 kms will be covered in about 6 hr. We visit the famous Hemis Monastery, founded in the year 1630 by Stag-tsang-ras-pa under the royal patronage of Sengge Namgyal. Hemis is one of the largest & richest monasteries of Ladakh. The two-day festival of monastic dance in July -August has raised the reputation of Hemis particularly high. The festival is dedicated to Guru Padmasambhava, popularly known as second Buddha & responsible for spreading Buddhism in the Tibetan world. From here we drive to Thiksey Monastery, which falls on the way to Leh. Thiksey Monastery(Gompa) is an impressive complex rising tier upon tier on a hill above the village. The monastery has a beautiful 30 m high gold-plated statue of Maitreya Buddha,the Buddha of the future. Finally we drive back to Leh. Today at leisure till lunch. 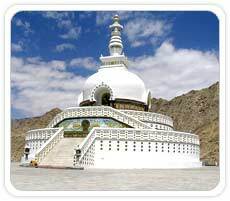 Later in the afternoon we go on half day tour of the monasteries around Leh & visit Shankar, Spituk& Phyang monasteries. 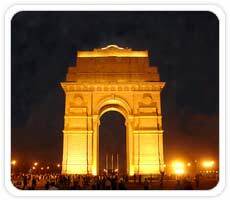 Today you will transfer to the Airport to board the flight to Delhi. Today we take a guided tour of Old Delhi, the 17th century walled city of Shah Jehanabad, Visiting the great Jama Masjid, the principal mosque of Old Delhi. Built in the year 1656 AD by the Mughal Emperor Shah Jahan, it is the largest & best known mosque in India. Later we walk down or take a rickshaw ride through Chandi Chowk, the old marketplace of Shah Jehanabad now a picturesque bazaar to reach Red Fort, built in the year 1648 by Shah Jehan. Our tour concludes Caper thanks you for your patronage & look forward serve you again in near future. 12 Nights accommodation on twin sharing basis with Breakfast.